This is Public Health: A Canadian History is an interactive e-book. It's engaging, richly illustrated, suitable for a broad audience and available as a free download. 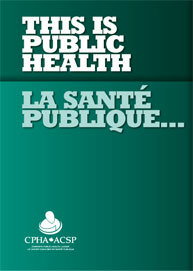 Canadian public health history is now accessible and easy to share! This is Public Health! is a "walking tour" of the last 100 years in Canadian public health. The EXPO celebrates our achievements and profiles the people who made them happen. The average lifespan of Canadians has increased by more than 30 years since the early 1900s and 25 of those years are attributable to advances in public health. There are various public health achievements that led to this remarkable feat.